All of GolfBC’s 9 golf courses in British Columbia have been certified Beginner Friendly by the National Golf Course Owners' Association. The GolfBC Group is pleased to follow-up the launch of the “Kids Play Free at GolfBC” and “Take-a-kid to the course week” programs by further committing to grow the great game of golf. To receive Beginner Friendly certification is a great honour for GolfBC and further strengthens our commitment to growing the game of golf. We are committed to ensuring GolfBC is recognized as a great place to learn the game. Participating courses are Nicklaus North, Mayfair Lakes, The Bear and The Quail at The Okanagan Golf Club, Gallagher’s Canyon and The Pinnacle, Arbutus Ridge, and Olympic View. What is Beginner Friendly Certification? 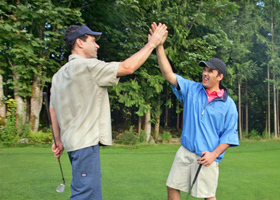 In order to receive the certification, courses across Canada and the United States completed applications, which were used to determine if the course welcomes new golfers. Courses were carefully evaluated on a number of criteria such as availability of clinics, loaner clubs, special playing times for beginners and other initiatives. For more information, please contact a participating GolfBC course.